Lemon balm has been used for centuries to improve anxiety symptoms and mood, one of the most common disorders in developed countries around the world. 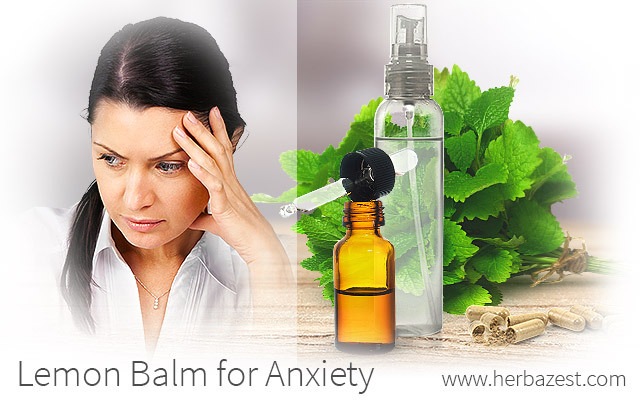 Learn more about the main causes of anxiety, how to use lemon balm for anxiety, and the best ways to consume it. Everybody experiences anxiety once in a while; however, anxiety can evolve into a disorder when it involves more than temporary worry or fear, and gets worse over time. Symptoms may include feelings of fear, dread, and uneasiness that may occur as a reaction to stress. A person with anxiety may sweat, feel restless and tense, and have a rapid heartbeat. Researchers have found that genetic and environmental conditions, frequently in interaction with each other, are risk factors that may contribute to developing anxiety. The difference between the anxiolytic and sedative effects of lemon balm is in the dosage. However, it is advised not to drive or operate machinery after consuming it. People taking antidepressant medication should consult their doctor before taking lemon balm for anxiety. Capsules are the most popular way to consume lemon balm, and they can be easily found at local herbal stores and through online retailers. The recommended dose for a calming effect is 300 - 600 milligrams, three times daily or as needed. This preparation can be especially helpful in reducing stress caused for sudden life changes, such as travel or moving out. Mix 10 - 20 drops of lemon balm essential oil with 60 grams or purified water and 30 grams of alcohol in a dark, glass spray bottle. Keep it in a cool, dark place and shake it very well before every use. Spray it freely all over the room, especially on the sheets and pillow. The aromatic oils of lemon balm will soothe the nervous system, thus reducing anxiety. A clinical study was performed at the University of Northumbria, Newcastle, United Kingdom (2003) in order to assess the cognitive and mood effects of dried lemon balm leaves. 20 healthy, young participants received single doses of 600, 1,000, and 1,600 milligrams of encapsulated dried leaf, or a matching placebo, at seven-day intervals. The most notable cognitive and mood effects were improved memory performance and increased "calmness after taking the highest dose (1,600 mg). However, lower doses also showed an increase in speed memory task performance and visual information processing. These results not only corroborated the effectiveness of lemon balm for anxiety, but also suggest that doses of lemon balm at or above the maximum employed during the study can improve cognitive performance and mood. Another double-blind, placebo-controlled experiment was conducted at the University of Northumbria in 2006 to evaluate the anxiolytic properties of lemon balm combined with valerian. 24 healthy volunteers received three separate single doses (600, 1,200, and 1,800 mg) of a standardized product containing extracts of both herbs, plus a placebo, on distinct days separated by a seven-day cleanout period. The results indicated that the 600-milligram dose of the combination decreased laboratory-induced stress levels. The effects of lemon balm on anxiety can be potentiated when combined with other herbs, such as gotu kola, sage, passion flower, and bitter orange. While the precise mechanism of its anxiolytic action remains largely unknown, the scientific studies and popular applications of lemon balm indicate that it can be safely used to reduce anxiety symptoms. Beyond Blue, Australia, What causes anxiety?